The return of Osman Sow will free up Chuks Aneke to get more involved for MK Dons, says manager Robbie Neilson. 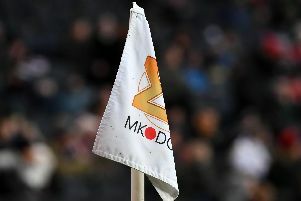 Sow's start to life at Stadium MK has stuttered with two injuries restricting him to just 11 appearances and two goals since arriving in August. Neilson has been desperate to partner the Swede with Chuks Aneke, but has barely been able to do it so far. And with Aneke being the key target for Dons, the manager hopes Sow's return will free him up to have more of an impact. "The partnership can be a really good," he said. "We've got Agard, Seager and Muirhead who can also play in there, but we need someone who can take a load off Chuks and link the play. That then frees Chuks up to play footballl, because although he's a unit of a boy, he's a good footballer too. "Osman brings a lot to the team with his pace and physicality, and it takes a load off Chuks Aneke too." While he is still chasing full match fitness, the 27-year-old played for 55 minutes against Shrewsbury last Saturday and looks set to retain his place in the side when Dons take on Scunthorpe at Glanford Park this weekend. Neilson added: "We knew we wouldn't get a full match out of him. I wanted to get 45 minutes from him, but I asked him at the break and he said he was tired but wanted to give it another 10 minutes. We can build on that now. It will take time. He's been stop-start, as it has for a few of the players this season, but we hope he's over that now and we can get him going." It's not just the manager who is excited to see the duo form a partnership, with defender Scott Golbourne saying the rest of the squad is keen to see how the pair perform together. He said: "We've got two powerful guys up front with different qualities and that's a lot for the defences in this league to cope with. We've been waiting to see how it looks, we're excited as a team to see it. "We've got a lot of quality with Kieran (Agard) and Ryan (Seager) too. And with everyone fit going into Christmas, with a lot of games, we'll need a lot from the strike force."